The minerals below our earth are a source of great wealth but for the people of our region it is the cause of great suffering and destruction. Government leaders say that mining will grow, our economy will develop and there will be end to poverty. But from our experience we know that our economies have grown weaker, people are poorer and the wealth of mining is the cause of wars and political conflict in our countries. Mining creates huge profits for big corporations and powerful individuals in our countries. Communities living near mines lose their land water and cattle. Traditional community life is disrupted. Mining destroys the environment, pollutes the air, water and soil. Our very planet is at risk due to excessive mining. This is a complex problem to solve and cannot be done in a day. Those who benefit from mining will resist change even with violence. People living near mines are forced to go on living with mines around them. But they are not passive, they struggle, they survive in spite of the hardship. Many local organisations have emerged supported by the work of progressive NGO’s, churches and international solidarity organisations. They are developing knowledge, innovative strategies, creative methods, tools and techniques of engaging the big corporations. But most of these organisation struggle in isolation. Their work is not known. Their experiences and the new ideas they create are not shared. Their voices are not heard. The project introduced here aims to break this isolation and silence and create a platform and network that will support communities to talk with each other. This project has been initiated by SARWA and the Bench Marks Foundation in 2016. Organisations from 7 countries helped shape the programme of activities. Organisations participating so far have been: Lesotho: Maluti Community Development Forum (MCDF). Mozambique: Associacao dos oleiros de Moatize (AAAJC) Tete. South Africa: Sekhukhune Combined Mining Affected Communities (SCMAC) Limpopo, ,Bua Mining Communities, Rustenburg, Community Monitors Mpumalanga, South Africa . 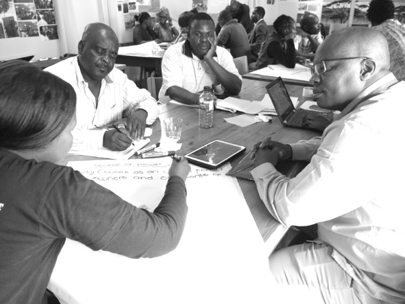 Zimbabwe; Save Odzi Community Network Trust (SOCNET), Marange Development Trust (MDT) , ZELA. In this workshop activists from the different countries presented their work to other activists, reflected on the challenges they faced, debated organising strategies, methods, tools and tactics. There is a remarkable similarity in the impacts of mining on the community life and the environment across countries. The differences among communities, relate to different legal and political conditions and different approaches to implementing (or non-implementation) the law, policies and rules by government officials. While these differences have led to different strategic approaches between local communities, there is lot in common among communities in the organisational methods, tools and tactics they use. Conduct and publish an annual review on the work, experiences and innovations of local community organisation in mining areas. We set up an internet /social media based platform and a system that would actively link as many local activists and organisations in on going sharing of information. We held a workshop with representatives from all participating countries to review and develop a 2018 strategy and plan. We are in the process of publishing an annual summary of events and happenings across the region. We have launched a regional and global campaign to give support to the community of Ruashi in Lubumbashi DRC to stop mine blasting which has lead to the death of a child resident. We will hold an international workshop towards the end of the year.